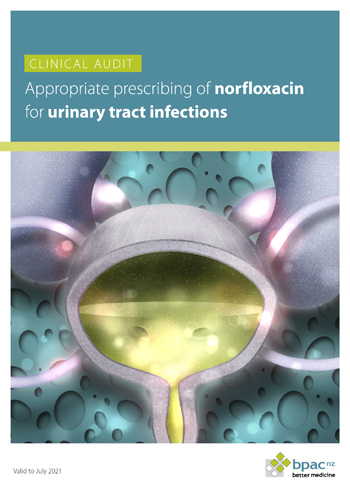 This audit focuses on the appropriate prescribing of norfloxacin for people with uncomplicated urinary tract infections (UTIs). With resistance to antibiotics an increasing problem, primary care clinicians need to be aware of what the appropriate empiric choices of antibiotics are when treating patients for suspected uncomplicated urinary tract infections. Lower UTIs are a common problem in general practice. The recommended first line empirical treatment for an uncomplicated lower UTI is trimethoprim, with nitrofurantoin an alternative choice. A urinary sample for culture and microscopy is not required before starting empirical treatment except in patients with complicated lower UTIs. When a patient fails to respond to treatment, a urinary culture to determine bacterial sensitivities is recommended prior to prescribing a second agent. Trimethoprim, nitrofurantoin and norfloxacin have a narrow range of indications for prescribing, and are predominantly used in the treatment of UTIs. The majority of people who present with symptoms and signs of a UTI in primary care can be initially classified as having an uncomplicated UTI; most of these will respond well to a short course of trimethoprim or nitrofurantoin. Norfloxacin is not recommended as a first line treatment for the treatment of lower UTIs. It is a broad spectrum antibiotic and its overuse contributes to increased resistance and to an increased risk of treatment failure in the future. It is recommended that norfloxacin is only considered as second line medicine, when first line empiric antibiotics have failed or resistance is confirmed.1 This is consistent with the 2014 amendment to the Pharmaceutical Schedule stating that norfloxacin is fully funded but only if it is prescribed for patients with uncomplicated UTIs where there is proven resistance or a lack of response to first line medicines and the prescription is endorsed accordingly. A re-analysis of national dispensing data for norfloxacin has shown that the rate of prescribing has decreased significantly since 2012*.2 The 2014 Schedule change requiring prescription endorsement is likely to have contributed to this decrease as has education regarding appropriate antibiotic prescribing. A further change that may have affected prescribing for UTIs in New Zealand is that trimethoprim has been available over the counter since 2012, according to defined criteria, from accredited pharmacists for women with uncomplicated UTIs. When prescribing antibiotics for patients with acute uncomplicated UTI, several factors should be considered. These include local bacterial susceptibility, the patient’s renal function, potential adverse effects and tolerance and the dosing regimens. In the majority of patients with uncomplicated lower UTIs, trimethoprim should be considered the antibiotic of choice. Nitrofurantoin is an alternative first line antibiotic when trimethoprim is contraindicated or not tolerated. This audit focuses on the appropriate use of norfloxacin for the treatment of patients with uncomplicated UTI. A urine culture is not recommended for patients who present with classic symptoms and signs of an uncomplicated UTI. Trimethoprim or nitrofurantoin should be the first line choices for empiric treatment. Norfloxacin should be reserved for patients where there is proven resistance or a lack of response to first line medicines. Ideally all patients who were prescribed norfloxacin for an uncomplicated UTI should have documented evidence in their notes that there was a lack of response to first line medicines or proven resistance on urinary culture. This is consistent with the endorsement restriction for norfloxacin on the Pharmaceutical Schedule that has been in place since 2014. However, for the purposes of this audit a target of 90% with documented evidence of treatment failure or resistance is suggested. Any patient that has received a prescription for norfloxacin for a UTI, in a time frame to be determined as below, is eligible for this audit. You will need to have a system in place that allows you to identify eligible patients who have been prescribed norfloxacin and audit their clinical notes. Many practices will be able to identify patients by running a “query” through their PMS system. The number of eligible patients will vary according to your practice demographic and your prescribing patterns. Only 5 dispensings for norfloxacin per 1000 patients were recorded for the average general practice in New Zealand between 1 July, 2014 and 30 June, 2015.2 A reasonable sample size for an audit is 20 patients, however, with the smaller numbers of patients now prescribed norfloxacin it may take 2 – 3 years of data to find sufficient patients. We suggest you initially search for patients prescribed norfloxacin over a 12 month period and if suitable numbers are not reached within this timeframe, extend the search to include a further 12 – 24 months. If the number of patients is still less than 20 beyond this time frame it would indicate that your prescribing of norfloxacin is appropriate. Identify patients who have been prescribed norfloxacin for a UTI. suspected bacterial urinary tract infection in adults. Guideline No. 88 July 2012 Available from: www.sign.ac.uk/pdf/sign88.pdf (Accessed Jun, 2016). Pharmaceutical Collection, Ministry of Health, 2016.